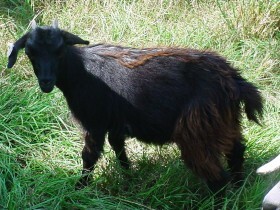 We raise Mini-Myotonic goats and started our breeding program in 2011. The Mini-Myotonic cannot be fully registered as such until it is three years of age. Males must be less than 23 inches and females less than 22 inches at the withers. 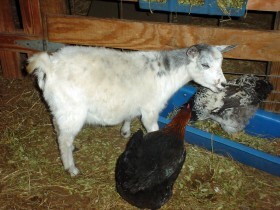 The photo to the left shows just how small these goats are. 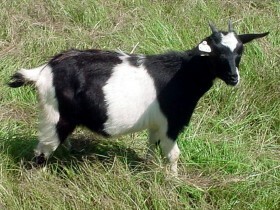 My breeding stock has come from Rose Lane Farm out of Kentucky and Bedrock Meadows from Central Florida. 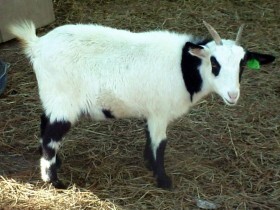 Some of the adults are polled (born without horns) and some have blue eyes. 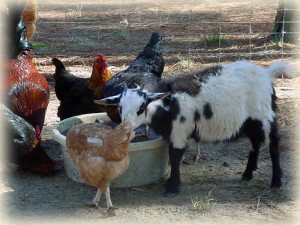 Several have longer hair on their sides and are referred to as Silkies. The girls started having kids in November 2011. 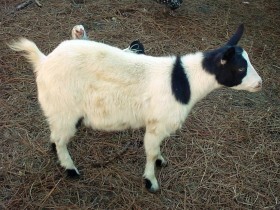 The following images show some of our current breeding stock. All of these are registered as Premium Myotonic, which means I had to furnish “down photos,” photos showing that they are proven to “faint.” Anything I register has a five-generation history. We will apply for the certification as “Mini-Myotonic” once they reach the age of three. My group of Mini’s are all smaller than the regular group and will be popular as pets.